These Bunny Tail Energy Bites are cute enough for your kiddos to beg for. Yet they are packed full of the nutrients you’re gonna feel good about as a mama! So last year, I had the brilliant idea to make these. Bunny tails! They were going to be cake pops and they were going to be adorable. I felt like I had the idea first. I just had to hurry up, make them happen, and get them on the site as soon as possible before someone else snagged the idea right from my head. I was so excited. I had something here and it was going to be a huge hit! The following morning, I got online, and one of the first things that popped up in my feed was this. The cutest box of bunny tails I ever had seen. My heart sank. I mean, I know there are so many duplicates around the interwebs, but it totally just sucked the life out of what I thought was a great idea that no one else had. And then this year so far, I’ve seen Maria’s cute little bunny tails as well. And then I decided it. No one has ever made a bunny tail the way I’m going to make a bunny tail. I’m going to put my classic health-nut spin on it, and it’s going to be cute, yet functional. 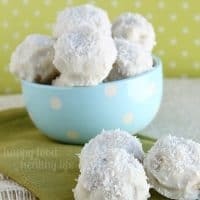 The bunny tails I’ve seen around are all full of sugar, and well, if I’m going to make a little treat for myself, I’m going to pack it full of goodness! After you check out the recipe that you most certainly should make today, be sure to check out my insider blogging lesson learned from this post… it’s at the bottom of the post. In a small saucepan over low heat, melt down almond butter, agave, and protein powder, stirring frequently. This will create a paste for the remaining ingredients. In a food processor or blender that you can pulse, pour in quinoa, flax, chia, pineapple, white chocolate chips, and macadamia nuts. Begin pulsing until the ingredients begin to combine. Pour in honey, almond butter, and protein powder paste, and continue pulsing the mixture. Continue pulsing until everything has come together and can be shaped. On a cookie sheet lined with parchment paper, begin rolling out golf-ball-sized bites with the mixture. 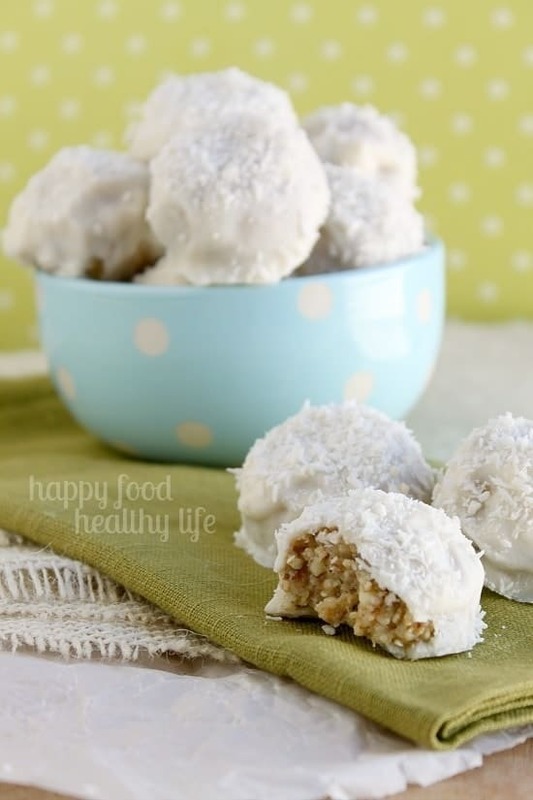 After each has been rolled into a ball, dip it into your Greek yogurt, coating evenly, and place on the sheet. 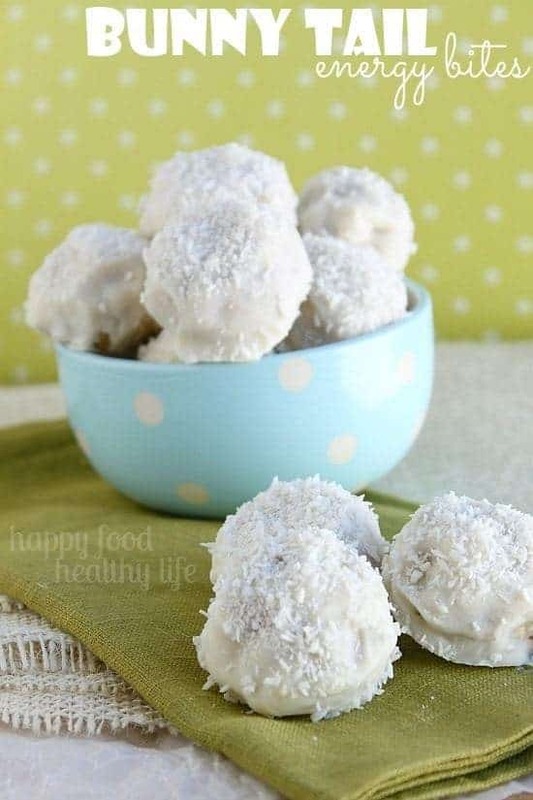 Sprinkle shredded coconut on the top of the bite, and move on to rolling and coating the remainder of the mixture. Once all bites are coated, place the cookie sheet into your freezer for at least an hour, or until the yogurt has firmed up completely. At this point, you can transfer the bites to a freezer-safe container or bag. Set out for about a minute to soften slightly before eating. Tip: The key to keeping your hands from sticking to the mixture when rolling them into the bites is to keep your hands a bit damp. A side lesson for bloggers: Remember not to get discouraged when someone out there seems to have “stolen” your idea. Remember, you are creative, and you have the ability to put your own spin on things. Whether it’s to make a dessert vegan or to up the health factor. Or if it’s a new combination of flavors. You can do it. There is so much space in the internet. Of course you want to site any inspiration you may have used in your creation, but you have the awesome talent to make it yours and make it shine! Perfect!!! These are so so cute and healthy! I can’t wait to make some 🙂 Thanks! Quinoa is my favorite thing to add to any and all recipes! This sounds so delicious, and I can’t wait to try them. I want to try this recipe! These are too cute! These are adorable! I know the whole family would love ’em! i love that you are calling them bunny tail energy bites! My rabbit has some white on her tail! I love that you have a rabbit! What a great substitute for all the sugary treats on Easter. Yum! Thanks for sharing on Merry Monday. Pinned. I do that often! I always think I am the first to come up with an idea and someone else always ends up beating me to it. These turned out great though! Thanks for linking up with Delicious Dishes Recipe Party! Adorable and sounds so healthy. Thank you for sharing with us @ #HomeMattersParty. We would love to have you again next week.